UJA Federation of Greater Toronto is proud to welcome home 57 community leaders and representatives returning from UJA’s Israel Engagement & ShinShinim Selection Mission to Israel. The mission, which took place from January 18-23, 2016, focused on learning about and experiencing Israel through the lens of Israel Engagement, reconnecting with the Shevet (ShinShinim alumni), and selecting the next Komunah (cohort) of ShinShinim. Indicative of Jewish Toronto’s ongoing and unbreakable bond with the people of Israel and reflective of a strong and strengthening relationship with the Jewish Agency For Israel, Toronto’s partner in the ShinShinim program for the past 10 years, our community is the one of few in the Diaspora that brings 57 representatives to interview and select the incoming group of ShinShinim. This was the largest group ever from Toronto, and the largest operating outside of Israel. A feature of this year’s program was a new partnership with the Nadav Foundation and the Beit Hatfutsot - the Museum of the Jewish People. Through cutting-edge workshops lead by educators of the International School for Jewish Peoplehood Studies, mission participants learned about what makes the Jewish community unique and how to educate towards the goal of strengthening Peoplehood. For Michael Diamond, founding chair of UJA Federation’s Israel Engagement Committee, this unique perspective was integral to the success of the mission. It was “a privilege to be with a group of 57 educators, formal and informal, religious leaders, lay leaders, and senior professionals of major organizations like Hillel and CYJ, all gathered with one critical goal- to build Jewish Peoplehood through Israel Engagement,” says Diamond. Another highlight of the mission was the annual Shevet reunion which brought together many of the more than 100 ShinShinim alumni living in Israel. This was an opportunity for Site Supervisors, Lay Leaders and UJA Professionals to reconnect with their past ShinShinim who continue to be Jewish Peoplehood leaders and maintain the special partnership between Toronto and Israel. The mission closed with a Shabbaton for trip participants and the 24 incoming ShinShinim. The gathering of this group for a unique Shabbat experience in Jerusalem was a joyous celebration, culminating with the meeting of the new ShinShinim’s parents and families coming together as one community of Israelis and Canadians. 2016/2017 will mark the 10th anniversary of UJA’s Israel Engagement ShinShinim. In looking ahead to Kommunah 10, “we have again chosen a group of 24 young Israelis who will bring Israel into our hearts and minds, as we continue to forge stronger and ever more meaningful relationships among Jews worldwide,” says Diamond. The successful recruitment process was a function of excellent recruitment and screening by Toronto’s partners in the ShinShinim program, the Jewish Agency for Israel. While the selection of our new ShinShinim was a mission priority, the ripple effect of the mission is invaluable. The relationship built between and among lay leaders and professionals from all of the institutional partners will continue to strengthen as they bring the lessons of the mission back to their local communities. 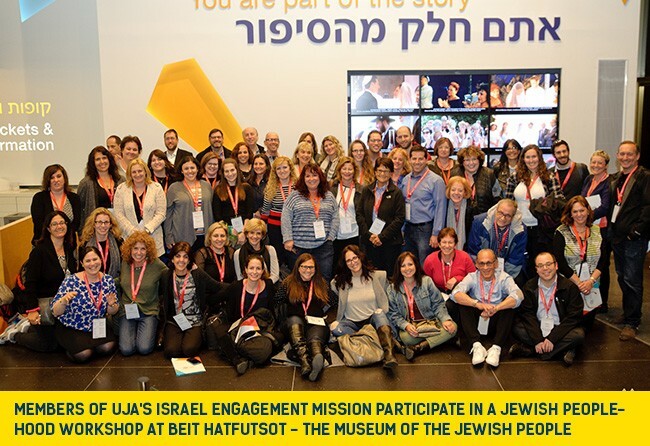 The mission was an amazing way to highlight not only the work done by UJA Federation of Greater Toronto in Israel, but to truly connect the leaders of our community and learn of the opportunities of collaboration and partnership between Toronto and Israel. We look forward to the exciting opportunities that the 10th year of UJA’s Israel Engagement will bring.